This is Albert, our Malawian gardener who, in 6 short weeks, transformed the wilderness at Custard Cottage into the modest beginnings of a cute cottage garden. I dragged him away from helping Terry mix concrete for building, to pose for this shot. I know! What a treasure to find him, he not only gardens but mixes concrete like an ace. Good quality light is of the utmost importance! Shoot in open shade if outdoors, for indoor images, place your subject near indirect light coming from a window or a door. Using a fast lens with a wide open aperture will make more light available to you. Avoid harsh direct bright sunlight. Use a reflector or polystyrene board to fill or open up the shadowy side of the face, unless you are purposely trying to create a moody shot. Shoot in manual mode, this gives you the freedom to override your camera’s light meter reading. Your camera measures the area you focus on, as 18% grey reflectance of light, it cannot see the world in living colour or black and white but rather in shades of grey, a neutral greyscale. So, when you focus on a very dark colour, your cameras light meter will tell the camera that the focus area is 18% grey and if you take the shot using that reading, your image will be over exposed and way too bright. There are a few ways to overcome that; use a grey card, meter off of something that is middle grey or you can try what I did. I first metered off of Albert’s face and then under exposed the camera reading by 1 f-stop, I focussed again but ignored the new light meter reading (that little row of stripes and numbers you see under the image when you look through your camera’s viewfinder) and took the shot. Granted, it is a bit of trial and error depending on how dark your subject’s skin is but if you don’t have a grey card to hand or something grey in the scene then this method should get you in the ballpark of what you want, exposure wise. Shoot in RAW you will have more control over the image in post processing if you need to tweak it. 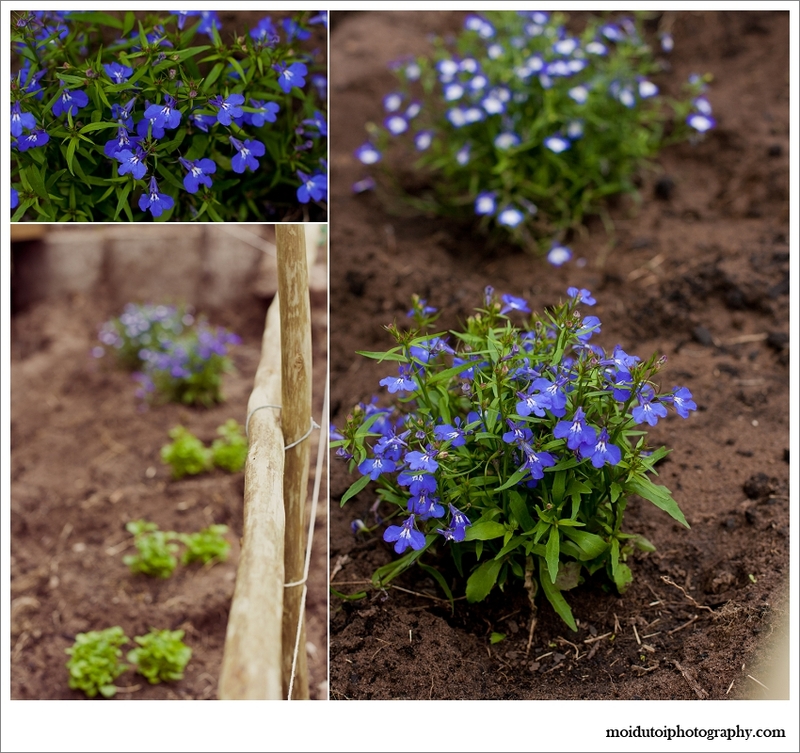 Some of Albert’s handiwork, aren’t these Lobelia colours delicious? We mixed a handful of bone meal into the soil for the new seedlings but then we had to build a makeshift fence around them for protection because Mr Paddington keeps digging them up, he’s convinced his bones are buried there! I’ve said it before and I’ll say it again, I’m no expert but if my photography tips help just one person then I’m chuffed with that. My instructor taught me that if you don’t have a gray card, you can meter off your palm which will generally read at about 35% gray. This is a trial and error process, obviously, as the tonal range of palms can vary . Take the reading, drop it one-two stops and voila! It works for me, so my hand must be 35%. We tested this in his studio using an incident light meter and getting the correct reading, then using our palms to see what our reading is. Loving these tips M! Albert looks like a real honey. Was so AWESOME seeing you and Terry the other day. Hope we can do it soon again.